According to the Nuclear Regulation Authority, Austrian non-government organization GLOBAL 2000 is attempting to halt the completion of Mochovce NPP by any means, including scaremongering. 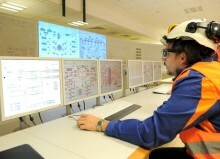 Slovenske Elektrarne rejects any shortcomings in the completion of the third and fourth nuclear unit in Mochovce. The Regulatory Office for Network Industries says that some salespersons of power suppliers are misleading consumers with false information.